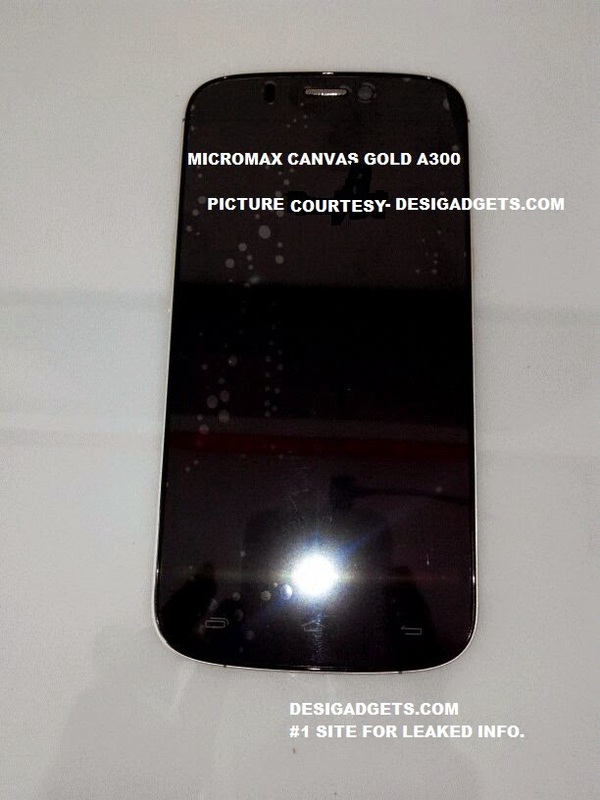 Micromax Canvas Gold (A300) Dual- the new exclusive rumor from the Indian smart phone manufacturer. The alleged flagship device has advanced smart phone features with high end configuration. The India tech website Desi Gadgets leaked the alleged smart phone images which show the design details such as display specifications and camera features. Indian market price of the device is 24000 and the expecting release date is June 16. Now there is no official word about the release of the handset. According to the various rumors the smart phone will be released at the upcoming "Witness our new Canvas" show conducted by Micromax officially. Here the Company will try to address the gathering with an attractive Canvas series package. Micromax Canvas Gold (A300) has a huge 5.5 inch Full HD Display along with Full Aluminium Gold Finish Body which is comparatively elegant. The smart phone runs the latest Android 4.4.2 KitKat platform and is powered by 2GHz Tru Octa Core Processor with 2GB RAM. The processor – memory combination accompanied by the popular software features are positively helps the smart phone. Digital cameras on the rear and front panel which, is comparatively good quality. 16MP Auto Focus rear camera with LED Flash and 5MP Auto Focus front shooter are the capturing devices on the phone. Earlier Micromax released their budget smart phones such as A105 Canvas dual and A091 Canvas Engage. The Company plan to extend their popular Canvas series and including more smart phones.